This is an extremely useful post on ProfHacker, with links to many resources. It’s also reassuring to read “this can often seem like an overwhelming topic to beginners” because I wasn’t sure if I was the only one who felt that way. That’s the challenge I’ve set myself for the next three months. The remaining sections of Social Media for Academics exist in embryonic form within this wallet. Each of the cards has an idea or theme written on it, functioning as a prompt for what I’m guessing will be 300-1000 words of writing. As well as pulling together the near finished chapters in order to send them off to my editor, I’ll be aiming to do 1000+ words per day from these cards. The wallet will be going with me everywhere I go (in the next month: Manchester, New York, Dubrovnik, Oxford, London x 2, Edinburgh, Manchester) to ensure that I get plenty of writing done while I’m travelling. I don’t normally travel this much and I was concerned it would break my writing rhythm. Whereas now I’m confident I’ll actually get a lot done. There’s going to be a weird combination of structure & minimalism in how I’ll be writing (a wallet & an iPad with no laptop in sight) that I’m actually quite looking forward to. As I wrote earlier this week, I’m really taken with my Artefact Cards. I’ve only had them for a week and I’m already convinced they’ll be a permanent part of my writing life. There’s a subtle permanence to the cards which lends a really useful sense of fixity to the ideas inscribed upon them. 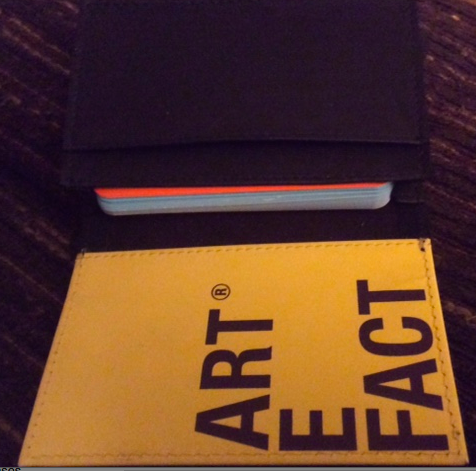 It really does feel like the rest of my book is contained in this wallet. From censored tweets to viral videos of professors’ partisan “rants,” numerous faculty members have found themselves in hot water over how they’ve used or been portrayed on social media in the past year. For faculty members at most colleges and universities, social media is a kind of “wild west” in which there are few – if any – articulated policies protecting professors’ right to tweet, post or otherwise share professional or personal thoughts (or to keep their thoughts private). To be fair, the article contrasts (good) “faculty-driven policy” to (bad) policy formulated by university managers. But is this dichotomy really tenable? To discuss regulation admits the premise that such control would be legitimate – is this the case? If so then it needs to be argued for in principle, rather than be smuggled in surreptitiously in the guise of pragmatism about the potential implications of academic social media use. It’s not obvious that regulation is necessary, all the more so when we consider broader trends towards precarious work within the academic labour market. I think this is a very complex issue. Much more so than anything I’ve read on the subject seems to acknowledge. This will be a large section of the final chapter of Social Media for Academics but I’m quite far away from being in a position to write it. My views on the issue are being shaped by some of the experiences that have been recounted to me in private – it’s difficult to know the extent to which these reflect a broader tendency beginning to emerge in UK higher education. If anyone has had experience of these issues and would like to talk then please do get in touch (mark@markcarrigan.net). It goes without saying that any experience recounted to me will be treated in the strictest confidence. I was intrigued to see this great project by Emma Jackson and a collaborator on Kickstarter. It’s fantastic that it seems to have been so successful for them. Is this likely to become more widespread? I find this quite exciting in some respects but also quite worrying, in so far as that it could easily be seized upon as a rationale for intensifying the retrenchment of funding which an academic turn to Kickstarter would (partly) be a response to. Nonetheless, I’ve been wondering for ages whether to try this myself and seeing this project has given me a nudge towards finally doing it. Lots of Planets have a North is a new project produced by sociologist Emma Jackson and artist Claire Biddles, exploring the North of England as it is lived, remembered and dreamed of. Bored of totalising accounts of a solitary man on a mission to uncover ‘the North’, ours is a communal project, made up of fragments, accounts, stories, poems and pictures collected from an open call for contributions early in 2014. Our project is a showcase for the stuff that gets missed out of the bricks and smoke, brass band, Hovis advert-style North of popular representation (although we have nothing against red brick, or smoke, or brass bands). The Glam North, Queer North, Missed North, Uneasy North, Dreamed of North, and lots of other Norths that aren’t explored often enough. Here’s a few selections from the project – you can see more on our project blog, too. This practically minded book will provide an accessible introduction to the opportunities and challenges social media presents for academics. It will situate the fast-changing landscape of social media in terms of the existing needs and priorities entailed by a career in the contemporary academy: publicising research, building networks, managing information and engaging with wider publics. It is intended as a ‘best practice’ guide, applicable to anyone working within higher education who seeks to better understand and utilise the opportunities offered by social media. Adopting a practical approach throughout, it will frame discussion of platforms and tools in terms of the concerns, projects and practices more broadly applicable within higher education. Though comprehensively informed by the growing research literature on social media, it will not in itself form part of that literature, but rather contribute to the practical application of the knowledge generated by this expanding field of inquiry. In keeping with the ethos of the book, I’ll be doing much of the work which goes into it here on my blog (i.e. the ‘social media for academics’ item on the menu bar). Much more to follow over the next nine months. ‘Scholarship’ is itself a rather old-fashioned term. Whenever I ask someone to think of scholarship they usually imagine a lone individual, surrounded by books (preferably dusty ones), frantically scribbling notes in a library. This is somewhat removed from the highly connected scholar, creating multimedia outputs and sharing these with a global network of peers. Scholarship is, though, a sufficiently broad term to encompass many different functions and so has the flexibility to accommodate new forms of practice. It is not only focused on teaching, or research, but also on a wide range of activities. In fact, a rather tautological definition of scholarship is that it is what scholars do. And a ‘scholar’ can be defined as a learned person or a specialist in a given branch of knowledge. Traditionally we have tended to think of scholars as being academics, usually employed by universities. This is the main focus of this book; it is the changes to university and higher education practice that will form the main discussion and research. However, digital scholarship broadens this focus somewhat, since in a digital, networked, open world people become less defined by the institution to which they belong and more by the network and online identity they establish. Thus a well-respected digital scholar may well be someone who has no institutional affiliation. The democratisation of the online space opens up scholarship to a wider group, just as it opens up subjects that people can study beyond the curriculum defined by universities. A simple definition of digital scholarship should probably be resisted, and below it is suggested that it is best interpreted as a shorthand term. As Wittgenstein argued with the definition of ‘game’ such tight definitions can end up excluding elements that should definitely be included or including ones that seem incongruous. A digital scholar need not be a recognised academic, and equally does not include anyone who posts something online. For now, a definition of someone who employs digital, networked and open approaches to demonstrate specialism in a field is probably sufficient to progress. Similar ambiguities obtain with the term ‘academic blogging’. I guess my fear is that that, unless this is more widely recognised, certain possibilities about what it could be taken to entail might be foreclosed i.e. ‘academic blogging’ comes to be defined as only one of the many specific activities that are currently subsumed under this rather vague term. I think there’s a real need for empirical research into how academics are using blogging platforms – looking at their intentions behind the activity, the practical results of it and developing taxonomies to better capture how these tools are actually being used (as well as the relative frequency of these uses and their distribution across disciplines) rather than taking the categories already in circulation as being heuristically useful for understanding this emerging field of activity. My fear is that the term ‘blogging’, as well as having all sorts of negative cultural connotations, actually obscures more than it reveals when used as an interpretive category.